This groundbreaking book offers information on the most effective ways that students process material, store it in their long-term memories, and how that effects learning for long-term retention. It reveals how achieving different levels is important for transfer which refers to the learner s ability to use what is learned in different situations and to problems that might not be directly related to the problems used to help the student learn. 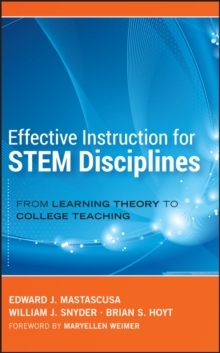 Filled with proven tools, techniques, and approaches, this book explores how to apply these approaches to improve teaching.